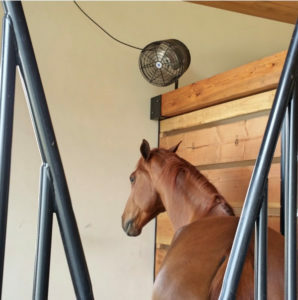 Equine Fans for Barns, Stalls, Aisles, and Arenas! Circulating Air is Healthy Air! Keeping horses cool and comfortable with fresh, well-circulated air can be crucial to their well-being and performance. Give your horses what they deserve; A COOL BARN with quiet, low-energy consuming, maximum air-flow fans! Individual horses are all different and all have their own unique needs from air circulation, spot heating/cooling and evaporative cooling, Cool Barns can provide each horse it’s own solution! As your barn changes and grows, your cooling and heating needs often change with it. Cool Barns is an environment solutions provider, find out what we can do for you. We would enjoy talking to you about a ventilating, cooling, or heating solution and helping you cool your horses and your barn! Here at Cool Barns, we want to help provide you with a solution! © 2017 COOLBARNS.COM - ALL RIGHTS RESERVED.